Charred debris and rubble is all that is left of a popular restaurant on Manhattan’s East Side after a Wednesday morning blaze ripped through the establishment, completely destroying it, while also damaging a mosque on the upper floors of the building. The FDNY says the fire broke out around 4:45 a.m. Wednesday, gutting Omar’s Mediterranean Cuisine on the ground floor and a mosque on the upper floors of the same building. Fire marshals dug through the debris of the burned restaurant located on East 55th Street on Lexington Avenue as they investigated the cause of the blaze. It is not thought to be suspicious. People in the neighborhood and loyal restaurant customers say Omar’s Mediterranean Cuisine was a popular establishment with a line out the door at lunchtime. 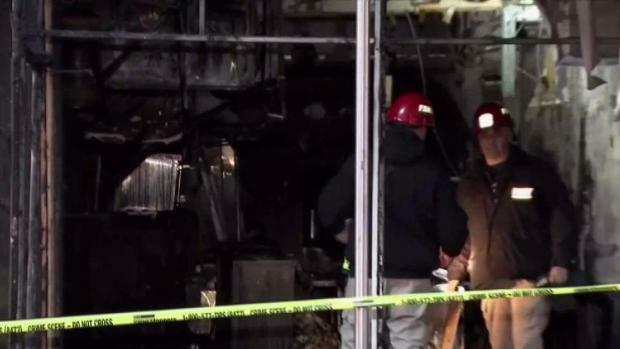 An investigation is underway after a fire gutted a popular restaurant in Manhattan. Katherine Creag reports. “Every time I pass through there is a line down the block no matter what time of the day it is and it is really unfortunate, I heard it burnt down,” Alyssa Azzinaro, who lives in the area, said. Four people suffered minor injuries, including two workers who were getting the restaurant ready for the day, and two members of the mosque, one of them the imam. The Islamic Society of Mid-Manhattan occupies the upper floors of the building where the restaurant is located. Those arriving for prayer service at 6 a.m. stood outside in disbelief. The mosque itself sustained some smoke damage. The restaurant's owner tells NBC 4 New York he will rebuild.